As almost everyone has heard over the past couple days, South Carolina’s Republican Governor Mark Sanford went AWOL several days last week, ostensibly hiking the Appalachian Trail, before being met at Atlanta’s Hartsfield-Jackson International Airport by an inquiring reporter from the Columbia daily The State. In reality, Sanford had just returned from a "spontaneous" trip to “exotic” Argentina where, he said, he drove the scenic coastline alone. Several observers have pointed out, some with great hilarity, that the governor would first have had to drive several hours through hundreds of miles of pasturelands, on short mid-winter days, before reaching the scenic coast of southern Buenos Aires province. If not, his best alternative was the capital's Avenida Costanera (pictured here), which runs past the domestic airport Aeroparque on the muddy River Plate estuary, before dead-ending a few miles north. In fact, in just a couple hours, Governor Sanford could have reached the scenic shoreline of Bahía Somborombón, an area of dunes and wetlands that’s ideal for bird-watching, about 180 km (110 miles) southeast of Buenos Aires via the city of La Plata. The governor, though, was after a different species of bird - one María Belén Chapur of Buenos Aires, with whom he had been carrying on an affair that had caused his wife to throw him out of the house. In a post early last year, I noted the shortages of coins in Argentina, and Buenos Aires in particular, which had made it difficult to pay for small items such as photocopies and bus fares. So acute has this shortage become that, in Argentina’s approaching mid-term congressional elections, it's become a political issue. President Cristina Fernández de Kirchner’s government recently decided to tackle the controversy by creating the Sistema Único de Boleto Electrónico (SUBE, Single System Electronic Ticket), a rechargeable public transit card usable on both the Subte (underground) and city buses. In the elections, which will take place this coming Sunday, many observers expect the government to lose control of the lower house and suffer a reduced Senate majority, but they hope to cut their losses. One of their tactics is the hastily introduced transport measure - SUBE cards began to be distributed last Friday - that has become common in other countries. For several years now, Santiago de Chile’s Transantiago system, which includes the Metro (underground) and city buses, has had a similar system, but Buenos Aires has lagged far behind. Whether this will be the electoral help the government hopes for is another question. In fact, the Subte, a few city-wide and suburban bus lines, and a couple suburban rail lines have had similar cards for a while; though this one unifies those systems, it’s still useless on most of the buses. Not only that, but distribution of the SUBE cards has been so slow that only 50,000 will be available before election day. Worse yet, according to the Buenos Aires daily Clarín, the cards - which are supposed to be distributed free of charge - are apparently being sold in the street. Last week my wife and I watched director Tristán Bauer’s 2005 film Iluminados por El Fuego (released as "Blessed by Fire" in English), which deals with the plight of Argentina’s 1982 Falkland Islands War veterans - more of whom have committed suicide than actually died in combat with the British. The story concerns a journalist, played by Gastón Pauls, who is called to the hospital 20 years later when a fellow conscript’s overdose leaves him in a coma for most of the film. Pauls, who played a Buenos Aires con artist in the highly acclaimed Nine Queens, is far more subdued here. The overdose incident sparks his character’s flashbacks on his war experience, when sadistic officers staked their starving troops to the ground, in freezing rain, for minor disciplinary violations. The conscripts were, many remarked, treated better by the British military to whom they surrendered. That makes it a little surprising when, toward the end, there are conspicuously cheap patriotic slogans that seem out of context in such an outspokenly anti-war film - even though most Argentines would agree that the islands should be theirs, for most of them it’s a pretty low priority. Much of the film was apparently shot in the vicinity of the Patagonian town of Puerto San Julián, where the landscape resembles parts of the Falklands, but the final scenes were shot in the Islands, as Pauls’s character makes a symbolic pilgrimage to the places where he and his comrades suffered so much. Given the islands’ small population, we thought it likely we’d see someone we knew from Stanley, where we lived for a year-plus in 1986-7 (pictured here as it was then). And sure enough, Pauls’s driver/tour guide in the film is Tony Smith, whose Discovery Falklands is one of the islands’ big travel and tourism successes. Tony, who is not a professional actor, handles his brief scene with Pauls extremely well, offering insights from the Islander viewpoint that rarely make the Argentine press. It was, he recently wrote me, “an interesting thing to do but...not so easy...because of the timing of everyone else involved and the patience you need to do such a thing.” That I can sympathize with, having once been recruited to portray Roman Polanski’s London producer, at 3 a.m. in Buenos Aires one morning, for a film on the life of Argentine movie diva Isabel Sarli. The entire report is available by subscription only, so I haven't seen it all, but according a report in Mercopress, Buenos Aires (ranked 61st) and Santiago (ranked 64th) are Latin America’s most livable cities. Other major Latin American cities ranked far lower, including Mexico City (105th), Caracas (118th), and Bogotá (127th). The highest-ranked U.S. city is Pittsburgh (29th). Vancouver scored 98 of a possible 100 on The Economist's curve, while both Buenos Aires and Santiago scored above 80.
and Buenos Aires cannot come close to matching Santiago’s magnificent setting at the base of the Andes (as seen from Cerro Santa Lucía here). 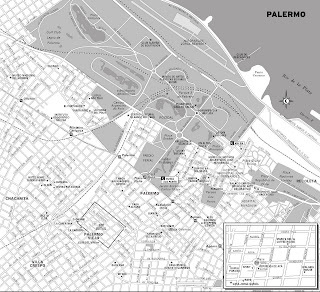 Santiaguinos also enjoy other public parks, such the Parque Forestal greenbelt along the Río Mapocho, with eastward extensions into the boroughs of Providencia and Las Condes, and the enormous Parque Metropolitano on Cerro San Cristóbal, just minutes from the densely built downtown. 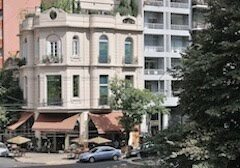 It’s true that many Santiago neighborhoods are homely, but the same is true of large parts of Buenos Aires, as any arriving visitor will note on the ride from Ezeiza airport to downtown. It's worth adding that, despite unpaved roads in some areas, Santiago has some of the continent's most sophisticated highways and ring roads, and perhaps its best airport. That’s not to denigrate Buenos Aires, which has so much to offer (and where we have a second home). It's merely to suggest that Santiago, with its surprisingly sophisticated cultural offerings, outstanding restaurants, glistening Metro system - not to mention first-rate activities such as skiing and whitewater rafting within an hour of the central Plaza de Armas - is not so far behind Buenos Aires as even some Chileans think. Since the early 1980s, Chile’s privatized flagship LAN Airlines has dominated the country’s airways with upwards of 80 percent of domestic passenger traffic, and by consensus it’s one of the region’s best - if not the best - air carriers. Its international service is probably superior to any other airline flying to South America from Europe, North America, and the South Pacific. It is also solvent. Within Chile’s borders, since the late 1980s, a long list of competitors - Aerocontinente, Air Comet, Avant Airlines, Ladeco, and National Airlines - has come and gone. In recent years, Sky Airline appears to have achieved viability but, given the hard times for the global airline industry, you never know. Given the difficulties of competing with LAN, it’s surprising to see a new Chilean carrier, Principal Airlines, about to begin services from Santiago to the Atacama Desert cities of Antofagasta and Iquique. According to Mercopress, Principal is a direct descendant of National Airlines and has operated as a charter carrier since 2003. Services are due to start June 18 and, even if the company eventually fails, there are some good deals to be had for the moment - fares will start around US$50, which is more than competitive with bus fares on the 18-hour overland route to Antofagasta. foothold that helped transform the rugged frontier of the arid lower Chubut valley into a garden spot. Still, it’s not quite true, as the Buenos Aires Herald recently suggested, that the Chubut valley “was so similar to their homeland.” Wales is a well-watered part of the United Kingdom, while eastern Chubut is a desert with, fortunately, a large river that irrigates its farms and fields, and even supplies a kelp-processing plant that’s the biggest industry of the tourist town of Gaiman. Still, Gaiman has its teahouses (as pictured here), the late Diana Princess of Wales was a celebrity guest in 1995, and it will even have its own cinematic moment. Welsh actor Matthew Rhys is the star of a new film entitled Patagonia, about “a thirty-something Welsh couple who travel to Argentina to reassess their relationship amid the Welsh settlements of Patagonia . . .” Rhys plays a Welsh-Argentine translator in the low-budget road film, a strong contrast with his conventional Hollywood TV and film work. 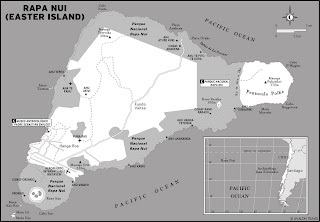 When the first Polynesian immigrants arrived on Rapa Nui (better known as Easter Island) , no later than about A.D. 800, they may have pushed their outriggers ashore at the north shore beach of Playa Anakena. Few visitors arrive by sea today - the great majority fly from Santiago or, alternatively, from Tahiti - but the occasional trans-Pacific cruise ship or private yacht still anchors off the village of Hanga Roa. In the absence of a pier, it shuttles its passengers ashore to visit the iconic moai for which the island has become famous. When seas are rough, though, getting them ashore can be difficult or even dangerous - on an island formed by three (dormant) volcanoes, the land plunges steeply into the sea and there are no good natural harbors. That may change soon, as Chile’s Ministerio de Obras Públicas (MOP) intends to build a pier to accommodate cruise ships at one of three locations: Caleta Hanga Piko (at the south end of town); Papa Haoa (west of Hotel Hanga Roa, which is presently undergoing a major renovation); and Vinapu (on the island’s south shore). The latter is close to a major archaeological site and, thus, the unlikeliest choice, and it’s also the most expensive at US$70 million. The photograph here looks south, and Papa Haoa is the rounded peninsula that juts to the west; Caleta Hanga Piko is immediately south. Papa Haoa would be the cheapest, at about US$20 million, while Caleta Hanga Piko would cost about US$60 million. Apparently, though, local opinion objects to the Papa Haoa site, which is almost untouched despite its proximity to town. Caleta Hanga Piko, according to the local Consejo de Ancianos (Council of Elders), “has already had human intervention” and even has a small harbor that can accommodate up to four yachts.